Pensare Ancora: Italy, the first of many photo posts. Italy, the first of many photo posts. Well ladies! it was a very relaxing trip. I refuse to get personal and these blogs, but I can say it was successful in more than just one way. Lets just say I finished what needed to be done. I promised plenty of street style, but that is where the disappointment comes in. I didn't get that much done! Honestly, there was nothing AMAZING. 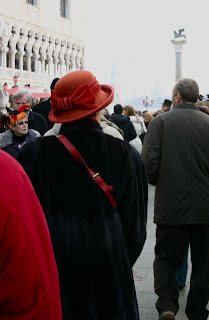 It was Carnival Week in Italy, where people dress up...as you will see in the photos...so that was rather distracting. I will post a few times a day with different photos and what not, but all of you wanting photography, I had no problem finding that, just nothing that blows me away. I couldnt get her attention, so I just snapped the photo from behind, because thats all I really wanted anyways. ps- can someone please explain The Catcher In The Rye fascination? I hated it. hahahaha. I know there is symbolism. someone fill me in pleaseeee! I didn't like that book either, I think lots of teens do though because it is very angsty. Eurgh. How stunning is this picture? SO STUNNING! Taha. I've answered my own query.